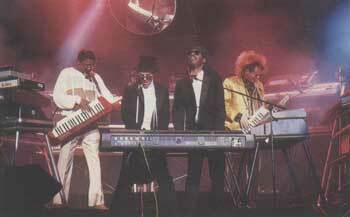 Here’s a clip from the 1985 Grammy awards with Stevie Wonder, Howard Jones, Herbie Hancock, and Thomas Dolby playing a synthesizer medley. This clip was meant to show off, ’80s style, modern musical technology with the keyboard/midi toys as used by innovators in their field. Wonder and Hancock were the synthesizer pioneers, while Dolby and Jones were the popsters who were meant to represent their successors, maybe. I just remember being very impressed at the time, and everyone at school talked about it the next day. These days, it stands as being pretty dated. But, a part of me still thrills at it in all of its cheesy glory. This is about as 1985 as you can get, people. Check Dolby’s Beethoven wig. Check Howard Jones’ haircut! Still, Stevie Wonder sings, which is usually pretty thrilling (‘I Just Called to Say I Love You’ notwithstanding…). And Hancock plays a snippet of his electro-hip hop hit ‘Rockit’, the one with the crazy video which was also talked about in the schoolyard. All in all, this is a taste of a more innocent age, back when everything was better when it was digital, and when technology in general was looked upon as the way to a bright, worry-free future.